NIPTON, Calif.; Feb. 13, 2014 ¾ NRG Energy, Inc. (NYSE: NRG), through its wholly owned subsidiary NRG Solar, LLC, today announced that the Ivanpah Solar Electric Generating System is now operational and delivering solar electricity to California customers. 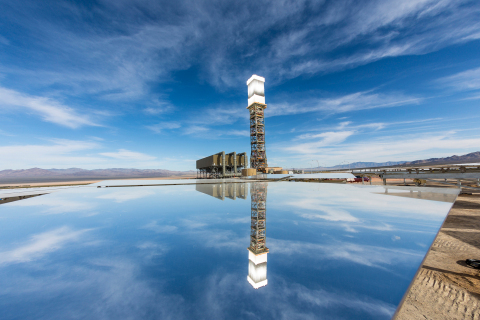 At full capacity, the facility’s trio of 450-foot high towers produces a gross total of 392 megawatts (MW) of solar power, enough electricity to provide 140,000 California homes with clean energy and avoid 400,000 metric tons of carbon dioxide per year, equal to removing 72,000 vehicles off the road. Ivanpah is a joint effort between NRG, Google, and BrightSource Energy. Bechtel is the engineering, procurement, and construction contractor on the project. The project received a $1.6 billion loan guarantee from the US Department of Energy’s Loan Programs Office. The facility achieved commercial operation on December 31, 2013. NRG will be the plant’s operator. Ivanpah, which accounts for nearly 30 percent of all solar thermal energy currently operational in the US, is the largest solar project of its kind in the world. The project is the first to use BrightSource’s innovative solar power tower technology to produce electricity, which includes 173,500 heliostats that follow the sun’s trajectory, solar field integration software and a solar receiver steam generator. Since breaking ground in October 2010, the project has created thousands of jobs and, at the peak of construction, employed nearly 3,000 site workers who completed more than 8.35 million man-hours. A total of approximately $650 million in salaries for construction and operations is expected to be paid over the next 30 years. The solar energy harnessed from Ivanpah’s Units 1 and 3 are being sold to Pacific Gas & Electric under two long-term power purchase agreements, while the electricity from Unit 2 is being sold to Southern California Edison under a similar contract. The Ivanpah Solar Electric Generating System is the largest of 11 operational utility-scale solar facilities in three states in which NRG has ownership interest. Ivanpah is also one of several NRG assets that are subject to a Right of First Offer Agreement between NRG and its publicly owned subsidiary, NRG Yield, Inc. (NYSE: NYLD). NRG is leading a customer-driven change in the U.S. energy industry by delivering cleaner and smarter energy choices, while building on the strength of the nation’s largest and most diverse competitive power portfolio. A Fortune 500 company, we create value through reliable and efficient conventional generation while driving innovation in solar and renewable power, electric vehicle ecosystems, carbon capture technology and customer-centric energy solutions. Our retail electricity providers – Reliant, Green Mountain Energy, Energy Plus and NRG Residential Solutions – serve millions of residential and commercial customers throughout the country. More information is available at www.nrgenergy.com. Connect with NRG Energy onFacebook and follow us on Twitter @nrgenergy. NRG, through its subsidiaries including NRG Solar LLC, has more than 2,000 MW of photovoltaic and solar thermal projects in operation, under construction or in development across the southwestern United States. More information is available atwww.nrgsolar.com. BrightSource Energy, Inc. provides the world’s premier solar field technology for concentrating solar power systems to deliver reliable clean energy to utilities and industrial companies. For more information on BrightSource Energy please visit www.BrightSourceEnergy.com. Bechtel is among the most respected engineering, project management, and construction companies in the world. We stand apart for our ability to get the job done right—no matter how big, how complex, or how remote. Bechtel operates through five global business units that specialize in civil infrastructure; power generation, communications, and transmission; mining and metals; oil, gas, and chemicals; and government services. Since its founding in 1898, Bechtel has worked on more than 22,000 projects in 140 countries on all seven continents. Today, our 53,000 colleagues team with customers, partners, and suppliers on diverse projects in nearly 50 countries. Visit www.bechtel.com. This news release contains forward-looking statements within the meaning of Section 27A of the Securities Act of 1933 and Section 21E of the Securities Exchange Act of 1934. Such forward-looking statements are subject to certain risks, uncertainties and assumptions and include NRG’s expectations regarding the Company’s Ivanpah solar project and forward-looking statements typically can be identified by the use of words such as “will,” “expect,” “believe,” and similar terms. Although NRG believes that its expectations are reasonable, it can give no assurance that these expectations will prove to have been correct, and actual results may vary materially. Factors that could cause actual results to differ materially from those contemplated above include, among others, general economic conditions, hazards customary in the power industry, competition in wholesale power markets, the volatility of energy and fuel prices, failure of customers to perform under contracts, changes in the wholesale power markets, changes in government regulation of markets and of environmental emissions, and our ability to achieve the expected benefits and timing of our solar projects. NRG undertakes no obligation to update or revise any forward-looking statements, whether as a result of new information, future events or otherwise. The foregoing review of factors that could cause NRG’s actual results to differ materially from those contemplated in the forward-looking statements included in this news release should be considered in connection with information regarding risks and uncertainties that may affect NRG’s future results included in NRG’s filings with the Securities and Exchange Commission at www.sec.gov.